AS THE campaign for the May 9 elections goes into the homestretch, the gloves are off for some presidential candidates. Leading the action is United Nationalist Alliance (UNA) standard bearer Jejomar Binay, who raised the intensity of his attacks on his rivals only a few days after a Pulse Asia survey showed his ratings had dropped. One can consider it a mere strategy shift or an act of desperation. An example. While Binay has been consistent in his criticisms of Liberal Party (LP) standard bearer Mar Roxas and the administration of President Noynoy Aquino and at times chides Partido Galing at Puso's Grace Poe, he was soft on PDP-Laban standard bearer Rodrigo Duterte. In the second presidential debate held here in Cebu City, Binay even shook Duterte's hand and bantered with him. Binay actually was sharing the stand of Roxas on the issue and also on Duterte's promise to end criminality and corruption in three to six months. Duterte responded to the criticisms the way Duterte does when piqued: he minced no words. "Wala, si Mar, bayot. Hindi niya kaya. Hindi. 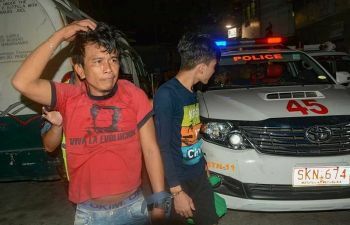 Kaya ko kasi lalaki ako," he said in an abs-cbnnews.com report. "Hindi ka lalaki, papaano 'yan? Takot kang pumatay, takot kang mamatay. Eh subukan mo ako. Maghawak ka ng shabu sa harap ko, pasabugin ko ulo mo...Ikaw bayot, ako kaya ko. Hindi ka marunong pumatay? Eh kung patayin ko lahat 'yan isang araw, anong pakialam mo. Ginawa ko na 'yun noon, eh ba di gagawin ko uli ah." Of course, we do not want the campaign to deteriorate into personal attacks and name-calling. That is why it is good to remind the candidates that they are doing a disservice to the people if they continue following this course as the campaign reaches a crescendo. What the voters want from them are more substantial issues on governance and the national situation.